Plants of the daisy (Asteraceae) family are distinguishable by their similar flower heads. Regardless of variety, they all have flowers that rest directly atop stem bracts, known as involucrate flowers, according to the Utah State University Herbarium. Daisy family flowers include roughly 25,000 species of trees, aquatic plants, shrubs, sub-shrubs and herbs. They're primarily ornamental garden plants, although the daisy family also includes artichokes and lettuce. The English daisy (Bellis perennis), which is a perennial native in southwestern Eurasia, stands up to 6 inches high and 9 inches wide. Hardy to minus 30° Fahrenheit, it has a low, spreading clump of 1- to 2-inch, deep green leaves. The new leaves, according to the Missouri Botanical Garden, are edible raw or cooked. From May to July, the English daisy has yellow-centered, pink or white two-inch flowers atop downy, 3- to 6-inch stems. The English daisy is happiest in cool weather, fading as summer temperatures increase. In cool summer regions, it may become invasive. Use it as a container plant, in rock gardens, as border edging, or in a wildflower garden with room to spread. Give it full sun to partial shade. Shade is best where summers are hot. It likes moist, fertile, well-drained soil, and prolonged drought will kill it. Evergreen chamomile (Chamaemelum nobile) is another low-growing perennial hardy to minus 30° F. This mat-forming, aromatic plant stems from 3 to 6 inches high with a 1-foot spread. Its reclining stems and yellow-centered, white-rayed daisy blossoms bloom from June to September. The crushed foliage releases a fruity fragrance. Dried chamomile flowers have a long history as a calming tea ingredient. Use this largely pest- and disease-resistant plant in rock or herb gardens, as a ground cover or a mowable lawn substitute, recommends the Missouri Botanical Garden. Plant it in full sun to partial shade. Chamomile is somewhat drought tolerant. It prefers sandy, well-drained soil and performs best where summers are cool. 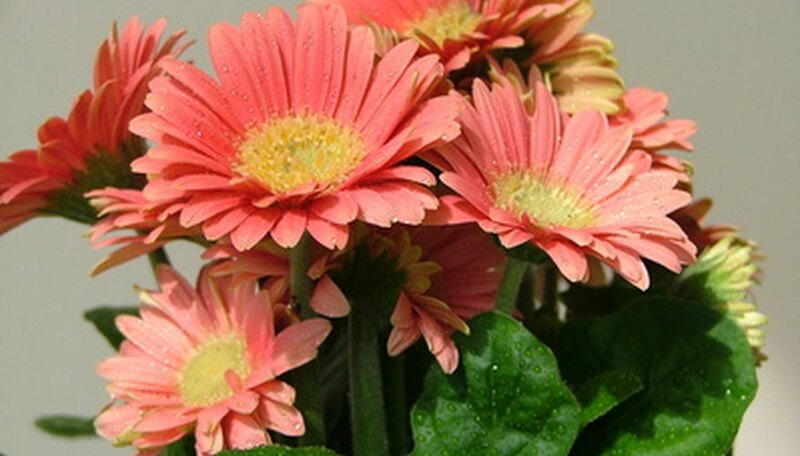 The Transvaal daisy (Gerbera jamesonii)--also known as the Gerbera daisy--is perennial in regions with winter temperatures higher than 10° F. Elsewhere, it's grown as a popular garden annual. Native to southern Africa, the Transvaal daisy forms clumps of narrow, deep green lobed leaves. Leafless stems between 1 foot and 18 inches high rise from this rosette. Each has a single daisy bloom. Cultivars in a wide range of bright and pastel colors around a yellow-to-bronze center are available. They bloom from summer to fall. The Missouri Botanical Garden advises planting Transvaal daisies in full sun with afternoon shade where summer temperatures are high. It needs averagely moist, rich well-drained soil, and does best where nights are noticeably cooler than days. Excessively wet soil may result in root rot.